A new doc examines the power of ACT UP. “Hi. We’re with ACT UP and we’re doing an act of civil disobedience. Please remain calm.” If you heard that phrase between 1987 and the mid-’90s, chances are you were a pharmaceutical, government or religious bigwig and you were about to get schooled big time by a herd of angry queers. Direct action advocacy in the face of a crisis forms the core of How to Survive a Plague, a rousing new doc directed by David France that opens Friday 21 at the Music Box Theatre. An AIDS tearjerker this is not. (If you’re seeking one, see 2011’s moving We Were Here.) HTSAP chronicles a turning point in the crisis when the community, spearheaded by playwright and rabble-rouser Larry Kramer and a team of men and women whose very lives were slipping away, mobilized for the sake of determining its own destiny. This isn’t to say there’s no tugging on the heartstrings—the first images are of an emaciated man with AIDS, likely just days or even hours from death. 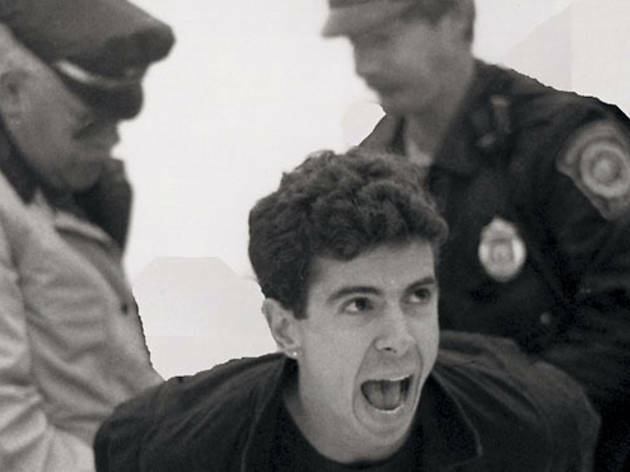 But the film quickly kicks into high gear with archival footage of a 1987 protest staged by a fledgling group of Manhattan activists who are mad as hell and calling themselves ACT UP (AIDS Coalition to Unleash Power). The fight is on. 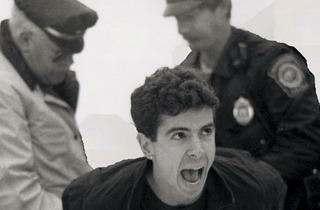 As the protest movement is born, AIDS has already claimed more than a half million lives. As one early AIDS physician puts it, “These are young, vibrant people and all of the sudden they’re being snatched.” In the absence of a single narrator, the only constant in the film is a recurring ticker that signals the current year and the rising global body count. Activists are in a race against time. Because AIDS curtailed rising acceptance of an emerging LGBT community, activists learn quickly how to become caretakers, scientists, clinicians, researchers, drug smugglers, pharmacists and troublemakers. AZT hints at success in prolonging the survival rates but costs $10,000 a year. Meanwhile, as the death toll surpasses the 1 million mark, higher-ups inside the Catholic Church are demonizing condom use (leading to the famous 1989 disruption at St. Patrick’s Cathedral during Sunday Mass). By using mostly archival footage, France keeps the viewer trapped in the worst years of the epidemic, and he’s in no hurry to let us out. At a running time of nearly two hours, the documentary delivers ACT UP’s every determined move with plenty of wonkery and science-speak thrown in so that most of us will walk away with an understanding of the virus we may never have had before. Ahh, so that’s how a protease inhibitor works. There is also levity. A film this devastating needs it. In one hilarious scene, activists interrupt Bush Senior by making out on the putting green while the President fumbles through his game. Notorious bigot Jesse Helms, meanwhile, gets punk’d by activists who cover his home in a giant condom that reads: a condom to stop unsafe politics. helms is deadlier than a virus. Balanced filmmaking this is not. By the early ’90s, the virus has claimed millions of lives worldwide, and without significant medical breakthroughs, the org is growing frantic. Fissures are threatening to splinter it. “Will the last person in Chelsea please turn off the lights?” says one activist at wit’s end. But in the darkness there is light. Protease inhibitors come along and, miraculously, some of the film’s talking heads are still alive to take them. But the damage is done. “Like any war, you wonder why you came home,” says one teary-eyed survivor. How to Survive a Plague is an instruction manual for queer activism done right. Today’s community might learn a thing or two by watching it. How to Survive a Plague opens Friday 21.